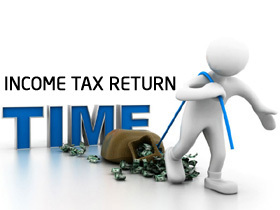 It’s time to file income tax return and you must be preparing for the same. Before you go ahead and file your income tax return, here is few important points which you should consider. This year onwards you will be able to e-verify your income tax return using electronic verification code (EVC). Last date of Filing of Income Tax Return is extended up to 31 August 2015 for the assessment year 2015-16. It is mandatory to file income tax return electronically if your gross total income is exceeding 5 Lakh. If your total income is not exceeding 5 Lakh you can take advantage of income tax rebat under section 87A. The maximum amount of deduction available under section 80C is extended from 1 Lac to 1.5 lac. You can invest in PF, PPF, NPS, and Tax Saving FD etc. to save tax. This year onwards additional deduction of 0.5 Lakh is allowed for the investment in NPS. For the Home loan interest limit under section 24 is extended from 1.5 Lakh to 2 Lakh this year. Verify your TDS details in Form 26AS with your TDS receipt, salary or Form16 before filing income tax return. New simplified Income Tax return form is introduced this year onwards. Under New ITR you need to mention additional details like Aadhar card number, Number of saving accounts etc. Medical insurance premium tax benefit limit is enhanced this year. You can claim 20,000 Rs for self & family. Additionally 30,000 Rs can be claimed for the medical insurance payment of parents. Entire expenditure for the preventive health checkup of self/family/parents is allowed for deduction under section 80D. Any donation made to political party or election trust is eligible for deduction under section 80G. Any cash donation up to Rs 10,000/- to registered charitable organization is exempted from tax. If you are e-filing income tax return without using digital signature you need to send acknowledgement ITRV to “Income Tax Department, CPC, Bangalore” by regular post or speed post within 120 days of e-filing income tax return. You can e-verify return in case of No refund. Compile and study all documents which are useful for filing return like bank statement/passbook, investment proofs, interest certificate etc. You are not supposed to attach any document if you are sending acknowledgement copy. If you need to pay any taxes as per income tax return, you should pay before filing return otherwise return will be treated as defective return. Ensure that you are mentioning correct PAN number, E-mail address and other details in income tax return. If you fail to file income tax return as per time specified for the assessment year accessing office may impose penalty of Rs.5,000/-. Under section 80TTA interest amount up to 10,000 Rs/- received from Bank on saving bank account is exempted from tax. From assessment year 2015-16, it is proposed that every assesse need to disclose foreign assets and foreign bank account details in income tax return. If you are trading in stock market for short-term remember short-term capital gain tax is applicable. If you are including income of your minor child in your income you can claim standard deduction of 1,500 Rs/- per child. Remember that there are 20 types of tax free income like agriculture income, dividend, gift etc. If you discover that you have made mistake by filing wrong information in income tax return you can revise your income tax return. You will be able to file revise return till due date. 31/8/2015. If you forget to file income tax return by due date you can still file return at later date but you have to be ready with paying penalty. Hope points mentioned above will be helpful to you for filing your income tax return. If you have any query related to income tax return do post in comment section.